Tire Kickin' the Supercharged "A"
If you are after the truth about cars, be ye now requited in your search, for GASKET GAZETTE is going all out in a series of tire-kicking articles about your favorite cars and equipment for them. We'll welcome your comments from time to time too, provided they are printable. For a kick-off (ouch - those Dunlops are hard on toes) Biil Payne andI took a vigorous spin in a trim black MGA hardtop with a Judson Super-charger. Thoroughbred Car Company furnished our car. The hardtop Coupe ($3100.00) is a new, and well received llne. Hardware and trim are well done and make a pleasant all weather car. The supercharger is the treat we came for though, so let's take a look: - first you are impressed with the silence of its operation. It was unnoticeable above the normal clatter of MG valves. Engaging first and giving power, immediately red lined the tach - surprise ! I figured this was too hot for a VW man, so I gave the controls to BilI and copied down the statistics as Bili skiilfully sped through the gears on our secret (between Broadway and Walker on Main Sireet - Editor) stretch of road. 0 to 30 in 4 seconds... on to 40 in less than 6 seconds ... to 50 in a little over 8 seconds ... and on to 60 in under 14 seconds and 70 in under 18 seconds. Better acceleration figures than this are claimed by the Judson people, but the performance we attained was impressive rememberlng the small, though excellent engine beneath the bonnet. Horsepower is noticeable when increased from 68 @ 5000 RPM to 105. Torque is felt even at high speeds when you accelerate. Top is about 115 MPH. Supercharging is about as simple a way to attain that miraculous performance as exists. Price is $245 + $65 installation, so it seems like a good way to have your cake and eat it too for you MG pilots who want more go without sacrificing long life and normal driving compatibility. 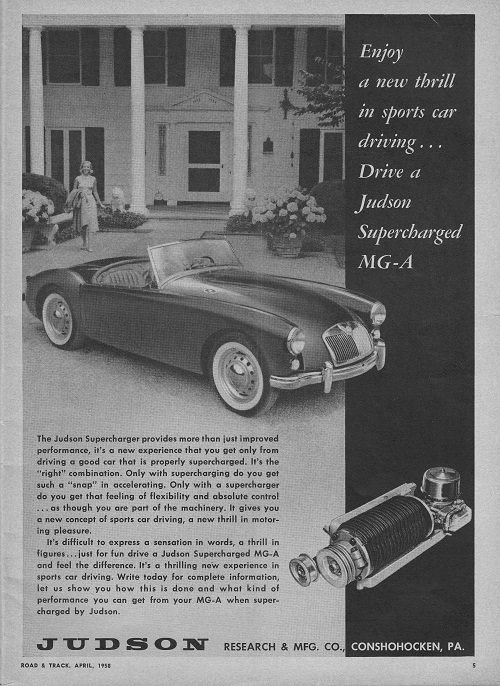 MGA Supercharged by Judson Specifications: Type - Rotary Vane - Positive Displacement. Manifold Boost Pressure - 5 1/2 lbs per square inch. Drive - Dual "V" Belt. Carburetion - Special with Fixed Jets, Lubrication - Independent - Ordinary Oil. Air Cleaner - Special for Supercharged Induction. Weight - 24 1bs.